The final of the JMS Veteran’s Team handicap competition took place at Finch Hill on Thursday 18 September on a warm sunny morning. The first four matches played went the way of Peel Sunset with Mary Moffatt winning to single figures, the score at that point being 99-76 to the westerners, taking the handicaps into account , giving them a 23 point lead. The next game off was a 21-2 win to Viv Rush which slashed the lead to just 4 points, leaving two games on the green in a nail-biting finale. Dee Lewis came through 21-14 giving Onchan B a three point lead leaving Cath Parker and Irene Cowin battling out the last game. A 21-13 win to Cath saw Peel Sunset through by 5 points. 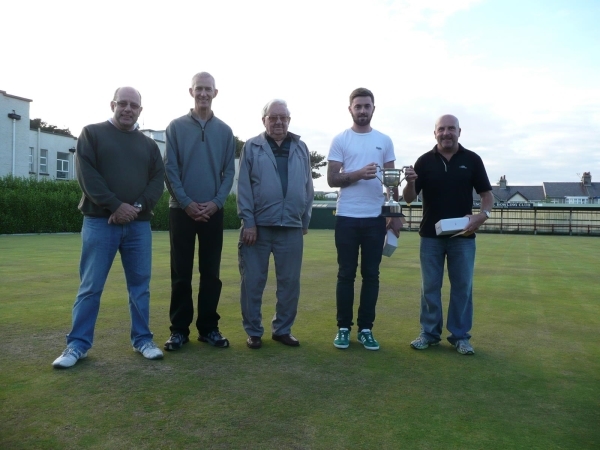 The winner’s results throughout the competition justified the handicapping as they had three narrow wins beating Castletown by 6 points, Port St Mary A by 6 points and Onchan B by 5 points. The presentation was made by Janet Shilling who had set the competition in motion two years ago. She congratulated both teams and thanked Finch Hill for the use of their green and facilities, and everyone who had contributed to the smooth running of the event. Joyce Kelly 21, Marilyn Ellison 15; Jean Quine 21, Barbara Kennaugh 13; Mary Moffatt 21, Eileen Thomas 9; Heather Horsburgh 21, Theresia Britten 14; Rose Corfield 14, Dee Lewis 21; Cath Parker 21, Irene Cowin 13; Mona Kerruish 2, Viv Rush 21. The JMS Veteran’s Shield semi-finals were played on Tuesday 16 September in weather conditions fit for the occasion. Port St Mary won the next three games and with just one game left on the green the visitors had a lead of 14 points, 115-101, including their handicap. In the remaining game Jean Quine had to reach 8 points to give Peel victory, and the tension in the visitor’s camp as she spent five ends on 6 then four ends on 7 was mounting. However she did get there, eventually reaching 13 against Win Collister. This fixture was evenly matched with both teams finishing on the same score, 127, before the handicaps kicked in to give victory to the visiting team. Ann Gale winning to 10 and Marilyn Ellison winning to 8 gave each team one convincing win, but the rest of the games were tense with everyone scoring 16+. Mary Simmonds had a “ding-dong” battle with Joyce Gardiner before the Onchan B captain came through 21-19,while Irene Cowin took Voirrey Oates all the way before going down 21-20. There was an entry of 33 for the IOM Ladies’ Merit for the Barbara Lee Trophy played at Ballaugh on Sunday 15 September. The green was running well and there were some very close, and some not so close, matches during the afternoon. Quarter-finals: Jenny Moore 21, Rita Callister 6; Alison Keggen 21, Jenny Maddrell 20; Ann Gale 21, Mary Alderson 16; Lilian Slinger 21, Caroline Whitehead 16. Semi-finals: Jenny Moore 21, Alison Keggen 17; Ann Gale 21, Lilian Slinger 13. The final could not have been closer as the two players matched each other throughout. After Jenny led by two points at 7-5 the next time there was a two point gap between the two players was on the 25th. end when Jenny led 16-14 and then increased the lead to three at 18-15. Ann took the next four ends to lead 20-18.Jenny replied with a two before getting a single on the 34th. end to take the match and the title. Association President, Pat Robertson thanked the Ballaugh club for hosting the event as well as all those who had helped in the smooth running of the afternoon before introducing Tracy Nicol, Barbara’s daughter, to make the presentations. The quarter-finals of the JMS Veteran’s Shield took place on Thursday 11 September with the weather being particularly kind for the time of year. As only seven teams entered there were only three matches played with Onchan B getting a bye into the semi-finals. Port St Mary A were in imperious form winning five of the seven games and dropping just four points, with four of their players winning to single figures. The two winnrs for Port Erin were Kay Primrose-Smith and Jean Thackrah who edged out Rita Callister 21-20. Tricia Bull 21, Sylvia Shelbourne 3; Rita Callister 20, Jean Thackrah 21; Win Collister 21, Steph Swift 5; Wendy Kennaugh 21, Jacqui Elliott 8; Kath Looney 18, Kay Primrose-Smith 21; Val Macfarlane 21, Hesba Skelly 10; Margaret Tasker 21, Sylvia Maddrell 6. Ballaugh also won five games against Noble’s Mixed with Ann Gale and Maureen Trustham winning to single figures. The two winners for the visitors were Pat Dacre and Lin Ruscoe, who also won to single figures while Meg Williams nearly added a third reaching 20 against Peggy Griffin. The closest match of the morning was at Castletown with Peel Sunset having the edge 4-3 on games with Mary Moffatt winning to single figures..In reply Marie Ashurst also had a good win to single figures. The other five games were much closer with the visitors coming through to take the match by just 6 points. Anne Oates 14, Heather Horsburgh 21; Hilda Young 21, Cath Parker 16; Barbara Young 21, Rose Corfield 13; Elaine McElroy 1, Mary Moffatt 21; Joy Stephens 15, Mona Kerruish 21, Sheila Preston 17, Joyce Kelly 21; Marie Ashurst 21, Jean Quine 8. Another Festival has come to an end and after a glorious week weather-wise. Manx ladies made their mark with some strong performances during the latter stages. It looked promising in the main event on Thursday afternoon when the last 32 contained 14 local players, but with some of them coming up against each other ,seven remained in the last 16.With Jenny Moore, Lin Ruscoe, Meg Williams, Joyce Kelly and Janet Monk going out at that stage only Tricia Bull and Chris Price remained in the quarter-finals. Tricia lost out 21-13 to last year’s winner Tracy Ryan, while Chris lost to eventual runner-up, Violet Dennison, 21-15. This gave Chris the Blanche Kaye Trophy fr the Manx lady who had progressed furthest in the competition. In the Tourism event two local ladies made it through to the semi-finals on Thursday morning, Elaine Moore going out at that stage to Eilleen Pye while Rachel Quirk went through 21-20 against Tracy Ryan. Rachel then beat Eileen Pye to progress to the final where she went down 13-21 to Claire Williams. The four pairs in the ladies’ doubles semi-finals all contained a Manx lady, Jenny Moore and Val Young putting out Lyn Bolton and Hilary Forshaw, while Helen Martin and Janet Gleave saw off Elaine Moore and Dawn Benn. In a very close final Helen and Janet Came through to win 11-9. In the ladies’ consolation Paula Garrett made it through to the quarter-finals but three out of four pairs in the Mixed doubles semi-finals contained a local lady. .Lyn Bolton and Andy Mailer put out Heather Horsburgh and Brian Furber 9-7 to meet Margaret Tasker and Richard Hoyles in the final In another close encounter Margaret and Richard came through to take the title 9-7. The Castletown ladies’ singles, sponsored by the Bowling Green Café, took place on Sunday 31 August in glorious weather. The 10.30 am start saw a field of 45, including 15 visitors, gather to produce some fine bowling. The quarter-final stage saw three local players, Margaret Tasker, Lyn Bolton and Elaine Moore bow out together with Paula Gamon ( Norley) while Chris Price and Cath Wall (Lloyds Manchester0 progressed to the semis, leaving the final to be contested by Carleen Doody-Millington ( Wrockwardine Wood) and Veronica Lyon (West Derby Recs). In the final Carleen had the better of Ronnie, who had been bowling superbly all afternoon, to come through to take the game, and trophy, 21-12. Thanks go to Ellen from the Bowling Green Café for sponsoring the event. The final matches in the C Tarleton Hodgson and Son Ltd Sponsored ladies’ league 2014 season were played on Friday 29 August with the Douglas v Ballaugh match being played the night before. Port St Mary ended as Champions with a 44 point advantage over second placed Mooragh Park, while a final spurt from Peel Sunset moved them ahead of Noble’s Mixed to take fifth place. It was fitting that Mooragh Park and Port St Mary met on the last night. In a relatively low scoring match the home side had the better of it winning 5-4 on games with Janet Monk and Chris Price winning to single figures as did Margaret Tasker for the visitors. There were two stand-out games as Ellie Cowell reached 19 against Val Macfarlane and Rosemary Quirk came through 21-20 against Jayne Kneen. South Ramsey were top scorers, reaching 175 against Noble’s Mixed. The two winners for the away side were Lin Ruscoe and Paula Firth while Fiona Kennish won to single figures to go out on a high.The Douglas match was notable for having three 21-20 games, all going the way of the home side despite valiant efforts from Brenda Bowyer, Jane Teare and Pat Mason against Lynne Mansley, Wendy Cowin and Harley Garrett respectively. The two winners for Ballaugh were Ann Gale and Mary Simmonds.Peel Sunset had a comfortable 6-3 win over Port Erin with Joyce Kelly and Mary Moffatt winning to single figures while Castletown also won 6-3 against Onchan with four of their players winning to single figures. Purt le Moirrey had a tougher struggle against Marown, coming through 5-4 on games with Linda Dawson and Tracy Moore winning to single figures. Congratulations go to Chris Price for winning the merit. It was tight at the top with the top three having the same points for just being separated by points against. The weather was not kind to the 31 ladies who gathered at Peel on Saturday to compete for the Essie Quayle Cup with fairly heavy rain during the later stages. The green was running well and there were some very close games during the afternoon. Quarter-finals: Philippa Taylor 21, Mary Alderson 16; Chris Price 21, Janet Monk 20; Heather Horsburgh 21, Joyce Kelly 20; Lyn Bolton 21, Lin Ruscoe 16. Semi-finals; Philippa Taylor 21, Chris Price 16; Lyn Bolton 21, Heather Horsburgh 10. Early exchanges in the final brought the score level at 10-10 before Philippa had the better of the next few ends to take a lead 16-13 at which point Lyn pulled back to 16-17.Two singles and a 2 from Philippa brought her through to win 21-16 in an excellent game. The presentation was made by the winner of the “Wet T-shirt” competition, a water-logged Heather Horsburgh who thanked all who entered and those who had stayed to the conclusion of the competition. The draw has been made for the JMS Veteran’s Shield which starts on Thursday 11 September.